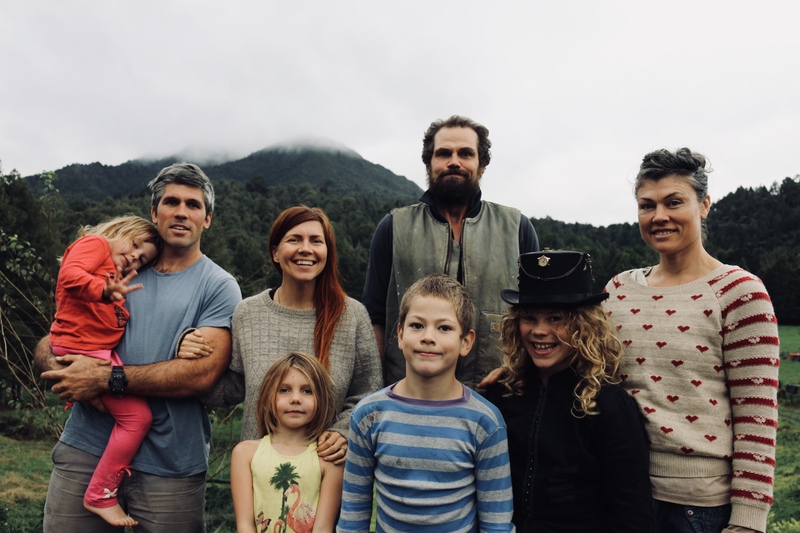 We are Rowan, Rebekah, Sandy, Aniren (and Lucera and Alice not pictured), Lucy, Tim, Ramona and Juno and we share a piece of land in Karangahake, NZ. We all spend our lives bringing to life our small, sustainable farm. As well as this, Rebekah coordinates the community gardens in Thames and Lucy is a writer. We have been on our shared farm for 2.5 years, slowly turning it into home. We have bees and cows and chickens and kitchen gardens and we are excited about turning more of the farm into native forest. We live without school, simply learning through life, and we get to watch our kids being driven by their joy and curiosity. We run a big homeschooling camp each year and every fortnight we have a forest play group where families come and hang out in nature together. We really want to share our land with people, to create opportunities for people to honour that tree hugging urge we all get sometimes!